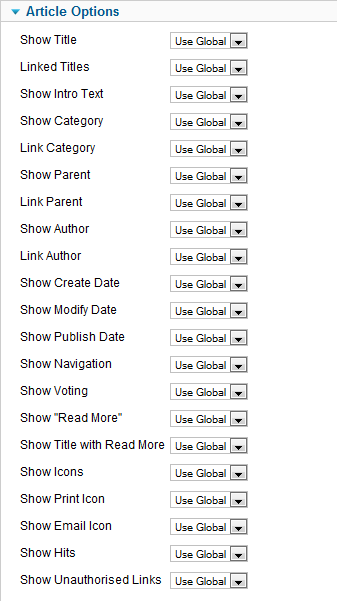 Click the Menu Item Type Select button and then click the List All Categories link under Articles. Used to show a list of Categories. 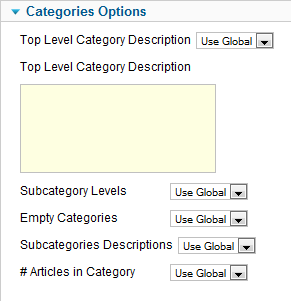 Categories are shown in a hierarchical list, as shown below. Depending on the selected options for this layout, you can click on a category Title to show the articles in that category. This layout requires that you select a starting top-level category. This is done in the list box shown below. To include all article categories, select Root. Otherwise, select the desired top-level category. All child categories of the selected category will show in the layout. Top Level Category Description. (Use Global/Hide/Show) Whether to hide or show the description of the top-level category. Note that this description can be overridden for this layout by entering a Top Level Description below. Top Level Category Description Override. 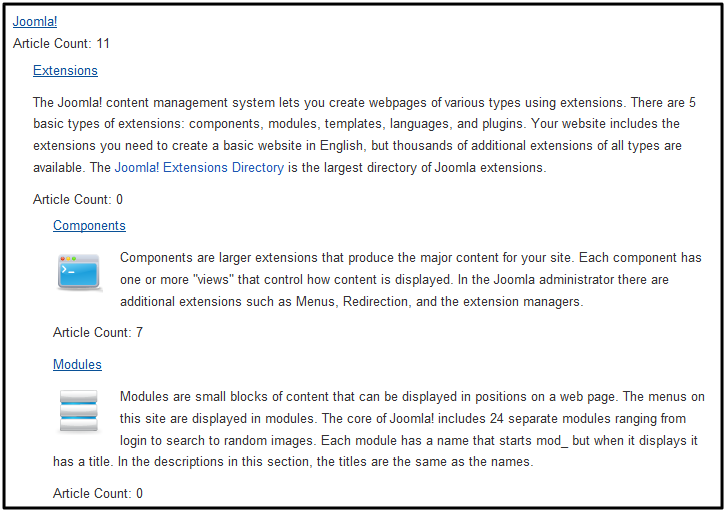 Enter an optional description to override the category description for this layout. If the Top Level Description option is set to Show, this entered description will show instead of the normal category description. Empty Subcategories. (Use Global/Hide/Show) Whether to hide or show categories that contain no items. # Articles in Category. (Use Global/Hide/Show) Whether to hide or show the count of articles in each category. No Articles Message. (Use Global/Hide/Show) If set to Show, the message 'There are no articles in this category' will display when a category contains no articles. When you drill down to a category, you will normally be in a list or blog layout. Which one will depend on the settings in the Article Manager Options and the Category Edit Basic Options. 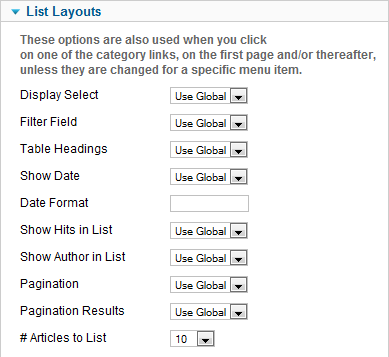 Blog Layout Options control the appearance of the category drill down if that results in a blog layout. 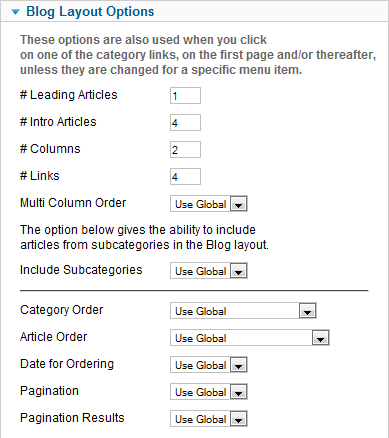 Important Note: If there is a Category Blog menu item defined for a category, the drill down will navigate to that menu item and the options for that menu item will control the layout. The options here only take effect if there is no menu item for a category. # Columns. The number of columns to use in the Intro Text area. This is normally between 1 and 3 (depending on the template you are using). If 1 is used, the Into Text Articles will display using the full width of the display area, just like the Leading Articles. Leave blank to use the default value from the component options. 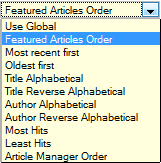 Featured Articles Order: Articles are ordered according to the Order column entered in Article Manager: Featured Article. Use Global: Use the value from Article Manager→Options. # Articles to List. The number of articles to include in the list. Select the desired number from the list box. 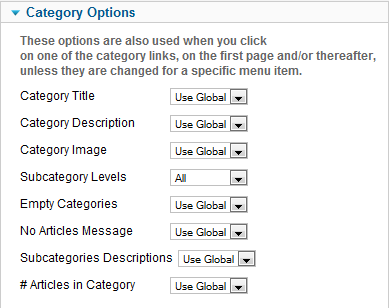 The List All Categories Layout has the following Article Options, as shown below. In addition to Yes/No or Hide/Show, these options allow the "Use Global" setting. This uses the default value from Article Manager Options. Show Voting. (Use Global/Hide/Show). Whether or not to show the a voting icon for the article. Show Print Icon. (Use Global/Hide/Show). Show or Hide the Print Article button. Show Email Icon. (Use Global/Hide/Show). Show or Hide the Email Article button. For each feed item show. (Use Global/Intro Text/Full Text) If Intro Text, only the article's intro text will show in the feed. Otherwise, the entire text of the article will show. This page was last modified on 20 February 2013, at 05:06.